The New York Times publishes a “special report” that claims the February 28 federal raid on the Branch Davidian compound outside of Waco, Texas (see 5:00 A.M. - 9:30 A.M. February 28, 1993), was “laden with missteps, miscalculations, and unheeded warnings that could have averted bloodshed.” The report is based on interviews with several Bureau of Alcohol, Tobacco and Firearms (BATF) agents involved in the raid as well as FBI agents and soldiers skilled in military raids. At least one of the BATF agents likens the raid to the infamously unsuccessful Charge of the Light Brigade. Four of the agents say that their supervisors knew the BATF agents had lost the element of surprise, but went ahead with the raid anyway. The Times says the raid was “the costliest and deadliest operation in the history of the” bureau. BATF leaders insist they did nothing wrong, and blame a last-minute warning about the raid to the Davidians for the agents’ failure to apprehend Davidian leader David Koresh. BATF chief Stephen Higgins said recently: “I’ve looked at it and rethought it. There was no problem with the plan.” But, the Times notes, the BATF “has provided only sketchy details of what happened, why the raid was even tried, and why it was carried out when it was.” The warrants that provided the basis for the raids are currently sealed (see February 25, 1993); no criminal charges have yet been filed; no government official has even clearly articulated what laws Koresh or his fellow Davidians are believed to have violated, though BATF officials say they believe Koresh has violated federal firearms and explosives laws, and Higgins told a reporter that it was the illegal conversion of weapons from semi-automatic to automatic that led to the raid. The BATF did not conduct round-the-clock surveillance on Koresh, so its agents did not know for sure if they could have arrested him while he was out of the compound. “Supervisors of the Bureau of Alcohol, Tobacco and Firearms knew they had lost the element of surprise even before the agents tried to surround the compound but ordered agents to move in anyway.” It was common knowledge in Waco and the surrounding area that something large was being prepared. Hotel workers were amazed to see men from Houston, Dallas, and New Orleans descend on their hotels, wearing army fatigues and talking on two-way radios, which area residents could monitor on police scanners. In addition, at least one BATF official alerted Dallas television news stations to the impending raid the day before it took place (see February 27, 1993). At least 11 reporters were at the scene before the raid began, though none have said how they knew to be there. The reporters now say the BATF did nothing to prevent them from watching and videotaping the raid, and add that agents only became hostile after it became clear that the raid was a failure. “Helicopters carrying [BATF] agents came under fire over the compound before the assault began, yet the bureau pushed ahead with the mission, which relied on an element of surprise.” The helicopters, on loan from the Texas National Guard and used to observe the raid from the air, quickly came under fire; a bullet passed close to the head of Philip Chojnacki, the agent in charge of the raid. When the helicopters were fired upon, several agents tell the Times, the raid should have been aborted. “That was inexcusable,” one career agent says. “As soon as those shots were taken, the raid should have been aborted. Instead, we were ordered to walk right into it.” He and others say that the agents who were heading toward the compound on the ground were not warned that shots were being fired by the cult. Treasury Department 'Derelict' in Duties - Treasury Secretary Lloyd Bentsen and Deputy Secretary Roger Altman were “irresponsible” and “derelict in their duties” refusing to meet with the director of the BATF [Bureau of Alcohol, Tobacco and Firearms, sometimes abbreviated ATF] in the month before the February raid, and failing to ask for briefings. Senior Treasury officials “routinely failed” to monitor BATF officials, knew little to nothing of the plans for the raid, and therefore failed to uncover the significant flaws in the plan. When the raid failed, Assistant Treasury Secretary Ronald Noble tried to blame the BATF for the failure, even though Noble and his fellow Treasury officials failed to supervise the BATF’s plans and activities. BATF 'Grossly Incompetent' - Some of the worst criticism of the report are leveled at the BATF. The report calls the agency’s investigation of the Davidians (see June-July 1992, November 1992 - January 1993, and January 11, 1993 and After) “grossly incompetent” and lacking in “the minimum professionalism expected of a major federal law enforcement agency.” The agents in charge of planning decided to use a “military-style raid” two months before beginning surveillance, undercover, and infiltration efforts. The agency did have probable cause for a search warrant against Koresh and the Davidians (see February 25, 1993), but the affidavit applying for the warrant “contained an incredible number of false statements.” The BATF agents responsible for the affidavit either knew, or should have known, the affidavit was so inaccurate and false. 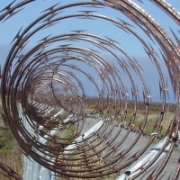 Koresh could easily have been arrested outside the compound, the report finds; the BATF planners “were determined to use a dynamic entry approach,” and thusly “exercised extremely poor judgment, made erroneous assumptions, and ignored the foreseeable perils of their course of action.” BATF agents lied to Defense Department officials about the Davidians’ supposed involvement in drug manufacturing, and by those lies secured Defense Department training without having to reimburse the department, as they should have. The raid plan itself “was poorly conceived, utilized a high risk tactical approach when other tactics could have been successfully used, was drafted and commanded by ATF agents who were less qualified than other available agents, and used agents who were not sufficiently trained for the operation.” Plan security was lax, making it easy for the Davidians to learn about the plan and take precautions. 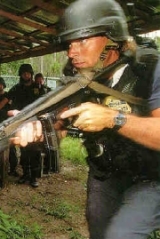 The report singles out BATF raid commanders Philip Chojnacki and Chuck Sarabyn for criticism, noting that they endangered BATF agents’ lives by choosing to go ahead with the raid even though they knew, or should have known, the Davidians had found out about it and were taking defensive action. 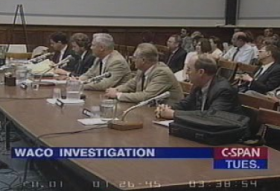 “This, more than any other factor, led to the deaths of the four ATF agents killed on February 28.” The report is highly critical of Chojnacki’s and Sarabyn’s rehiring after they were fired (see December 23, 1994). The report also cites former BATF Director Stephen Higgins (see July 2, 1995) and former Deputy Director Daniel Hartnett for failing to become involved in the planning.